Rainforest Alliance Certified™ farms are those that have met the comprehensive environmental, social, and economic criteria associated with our Sustainable Agriculture Standard. While farmers tell us that meeting these criteria is a challenge, they also recognize that doing so helps them to farm intelligently, gain confidence, grow their businesses, and plan for their futures. Rainforest Alliance certification directly benefits more than two million farmers around the world, as well as their workers and families. Certified farms and companies that source products or ingredients from certified farms may use the Rainforest Alliance Certified green frog seal, if they meet our seal guidelines. Visit the Chain-of-Custody certification page to learn more. Over 100 agricultural crops can be certified according to the Rainforest Alliance Sustainable Agriculture Standard. Cattle operations may be certified if the cattle is not completely raised in stables or under nomadic production systems. Cattle covered under the Sustainable Agriculture Standard include: domesticated animals of the family Bovidae, including the species Bos taurus and B. taurus indicus (zebu), or crosses of these two, as well as buffalo breeds (Bubalus bubalis), that are raised for meat or dairy production. The Sustainable Agriculture Standard’s certification criteria guide farmers toward sustainable farm management and give independent certification bodies concrete measures by which to evaluate a farm’s social and environmental improvements. Farms that meet the certification requirements are awarded the Rainforest Alliance Certified™ seal, a prestigious badge that can be used to market products grown on certified farms or cattle operations. Costs can vary significantly, depending on the complexity and scope of the audit, and the location of the farm. Costs are based on auditor time for the on-site evaluation, report writing, and travel expenses. In addition, the certification body must perform a technical review of the audit report and allocate time for administrative tasks, such as audit preparation and data maintenance. Visit our Responsibilities and Costs page for a general overview. For a specific estimate, please contact the certification body of your choice for a quote. What are the criteria for a farm to obtain certification? To earn certification, a farm must comply with the certification requirements of the Sustainable Agriculture Standard and the Certification Rules. What makes Rainforest Alliance certification different from other certification systems? Rainforest Alliance certification is built on the three pillars of sustainability—environmental protection, social equity, and economic viability. Because no single pillar can support long-term success on its own, we help farmers succeed in all three areas. Since the Rainforest Alliance’s agricultural certification program began in 1992, it has spread to over 40 countries around the world where the well-being of millions of farmers, workers, and wildlife species is at stake. More than two million farmers, farm workers, and their families directly benefit from Rainforest Alliance certification. Our experience, mission, and grassroots strength combine to distinguish Rainforest Alliance certification from other agricultural certification programs. Does Rainforest Alliance certification require a farm to be organic? Organic agriculture is an important, worldwide movement to make farms productive without the use of synthetic pesticides and fertilizers. The 2017 pesticide management requirements of the Rainforest Alliance Sustainable Agriculture Standard are based on a robust integrated pest management approach and the regulation of 320 active pesticide ingredients. This regulation includes the prohibition of 125 pesticides covered by the WHO/FAO framework of Highly Hazardous Pesticides, the prohibition of 25 obsolete substances and specific risk management requirements for an additional set of 170 active ingredients. Rainforest Alliance certification approaches farming in a holistic manner, and we have demonstrated that our criteria afford a realistic and effective way for farms of all sizes to move toward a reduction in agrochemical use. How is the certification program financed? In addition to funding from private foundations, government grants, and individual donors, the Rainforest Alliance began implementing a participation royalty on January 1, 2011. This royalty is collected once from companies in the middle of the supply chain. Is there a market for Rainforest Alliance Certified products? The term “sustainable” has seeped into the public consciousness as shorthand for all the things that we do to fight poverty and pollution, and protect the Earth’s resources for the benefit of the next generation. Smart shoppers everywhere are increasingly demanding groceries from sustainably managed farms and looking for ecolabels that verify the source of these goods. Trendsetting food companies and supermarkets want to know more about how their products were grown—where and by whom—and with what social and ecological consequences. There is a growing consensus that certification is an effective way to ensure the establishment and enforcement of management practices that protect the environment, the rights of workers, and the interests of local communities. 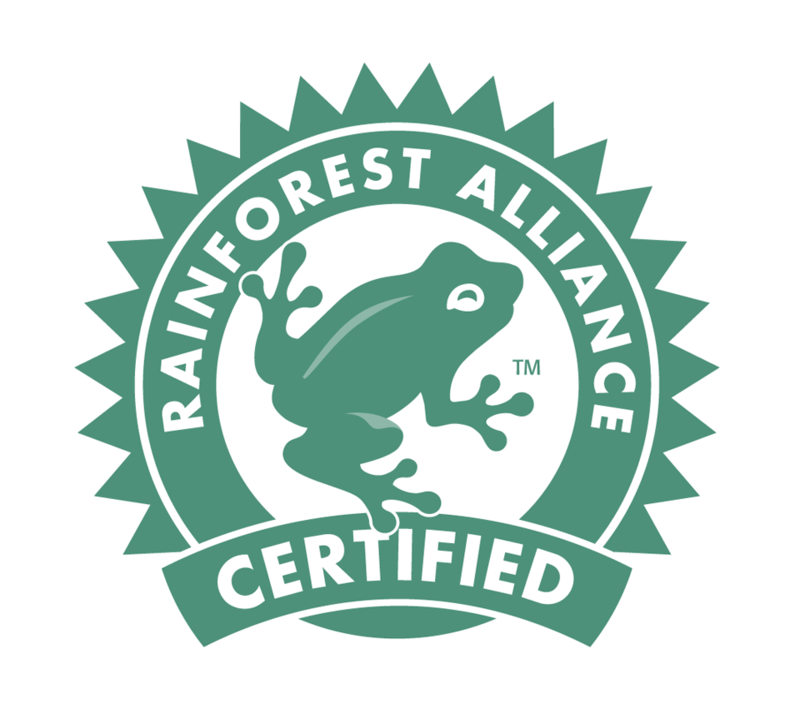 Already seen in countless markets, cafes, restaurants, and offices around the world, the Rainforest Alliance Certified seal is widely recognized as a leading symbol of sustainability. What is the relationship between the Rainforest Alliance and the Sustainable Agriculture Network? The Sustainable Agriculture Network (SAN) was created in 1997 by the Rainforest Alliance and other conservation organizations from the Americas as a response to concerns raised by researchers and ecologists in the 1970s and 1980s, when the relationship between the predominant development model and the destruction of the world’s tropical forests became evident. The SAN and the Rainforest Alliance subsequently co-owned and co-managed a comprehensive sustainable agriculture certification program. In mid-2017, when the Rainforest Alliance announced an intention to merge with the Dutch-based certification organization UTZ, the SAN decided to refocus its work in other areas, making better use of its network of local partners around the world. As of January 1, 2018, the Rainforest Alliance is the sole owner and operator of the agriculture certification program. The Rainforest Alliance continues to use the 2017 SAN Standard, as we have an exclusive and perpetual license to the 2017 SAN Standard. To reflect the full ownership of the certification program by Rainforest Alliance, the standard has been rebranded as the Rainforest Alliance Sustainable Agriculture Standard. Does the Rainforest Alliance provide training to farms? The Rainforest Alliance has technical advisors in several key countries across the globe. You can contact info@ra.org for more information. We also provide online training materials and an interactive Farmer Training App. For any further questions, please contact our Certification Program team at sas@ra.org.